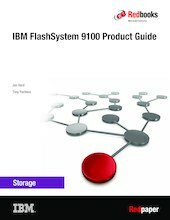 This IBM® Redbooks® Product Guide publication describes IBM FlashSystem® 9100 solution, which is a comprehensive, all-flash, and NVMe-enabled enterprise storage solution that delivers the full capabilities of IBM FlashCore® technology. In addition, it provides a rich set of software-defined storage (SDS) features, including data reduction and de-duplication, dynamic tiering, thin-provisioning, snapshots, cloning, replication, data copy services, and IBM HyperSwap® for high availability (HA). Scale-out and scale-up configurations further enhance capacity and throughput for better availability.